The Skulte port in north-eastern Latvia reloaded 66,600 tons of cargo in January 2018, which is a rise by 19.1% from a year ago, writes LETA, according to the information provided by the port. In January 2018 the port reloaded 35,800 tons of timber or by 80% more than a year ago. Woodchips were reloaded in the amount of 14,800 tons or 8.1% less year-on-year, and peat handling dropped 11.03% to 12,100 tons. In January, the Skulte port reloaded also 2,200 tons of grain, by almost 50% less year-on-year, 1,200 tons of carbon dioxide (CO2), down 25%, 500 tons of fish, up 67%. The annual cargo turnover at the Skulte port in 2017 was 819,800 tons or by 9.07% more than in 2016. There are three large and seven small ports in Latvia. 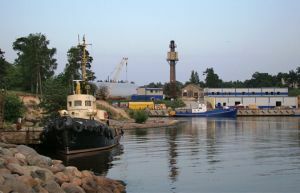 The Skulte port is the largest of Latvia's small ports by the cargo turnover in 2017.